INTRODUCTION EXAMPLES - Welcome to OPARG World! BD storage system (*) has been adopted, which consists of magnetic and optical storage subsystems. The optical storage subsystem has OPARG BD drives and OPARG BD-R discs manufactured by Pioneer and Mitsubishi Chemical Media, respectively. 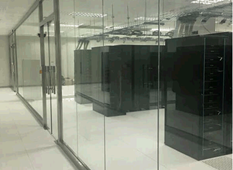 The data center saves the data created in the Guangdong Province and the BD data storage system is expected to help data center providers securely store big data with smaller running cost and less energy consumption. BD Archive System(**) has been adopted, which is composed of OPARG BD-drive and OPARG BD-R discs manufactured by Pioneer and Mitsubishi Chemical Media, respectively. This system is being used for storing photographs and scanning data of cultural properties preserved in SHOSOIN. Optimized Digital Archive System is constructed adopting Hard Disc Drives for utilization and Optical Discs for long-term preservation of digitized image data, respectively. Digital Archiving is being promoted to record and inherit precious cultural assets, and also to offer superior level of services by providing such valuable digital data to users. (*)Manufactured by Amethystum, an OPARG supporting member in China. (**)Compliant with JIS Z 6017 BD Archive. Conform to OPARG Archive Disc Technical Regulations. Estimated Life-time of a disc : over 200 years.